All-New Stamping manufactures the highest quality plastic stamping parts for simple to complex shapes. As a leader in the stamping industry, we have taken our years of expertise to produce plastic stampings for a variety of industries such as automotive, aircraft, electronics, medical, marine, consumer products and mechanical controls. 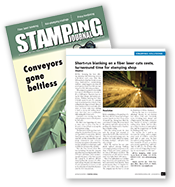 All-New Stamping’s staff has the experience and expertise to produce your part and deliver the product that is needed to your exact specifications. The most common plastics used for stampings are vulcanized fiber (fish paper), phenolic compounds, plastic/rubber compounds, laminates and film. When selecting the plastic compound to use, it is key to factor in the brittleness of the material to ensure that the finished part exhibits the proper hardness while not being too brittle that it will break. Plastic films, while strong, require special handling and tooling for stamping. We maintain a complete inventory of the most common plastic and rubber compounds and films, and stamp parts with thicknesses from .005-.250”. We also can provide specialty compounds or work with plastics you provide. All-New certifies all materials before they are accepted into inventory to ensure your part is manufactured using the highest quality plastic.